It was the perfect backdrop for a day of college football. Finally, that crisp autumn air was a little “nippier” and it was starting to feel like something special was going to happen. After Friday’s debacle at “The Ted” in Atlanta where the Braves shortchanged themselves and the umpires hopped on too we (I say we because I am native of the state but up in the mid-Atlantic) needed a pick-me-up. We needed the fifth ranked Georgia Bulldogs to erase the memory that was wasted opportunities and another Fall without extended postseason baseball. I didn’t watch ESPN’s Gameday coverage. I rarely do. You see, like many who are avid fans of their team, I tend to agree there is some form of “media bias” with the fellas in Bristol. Not all of them, but some. I know the power of words and even subtle slights are big problems in my book. It’s never a “dominating performance” when Georgia is involved. No matter the score or opponent there is always a lack of respect. But I also understand the flip side of the coin. LSU, Florida, Oregon, USC, Alabama and the like have earned their respect. Mark Richt has taken the University of Georgia on a nice ride since the Jim Donnan tenure ended but hasn’t quite gotten over that hump. But in the state of Georgia that was all set to end. We had the defense, we have the running backs, we have the veteran quarterback, and we have the ranking and pedigree to now hang with the “big boys” of college football. Georgia’s offense was top-5 in the nation and top-3 in scoring. We had all we needed, including a little bit of respect (read: concern) from that Steve Spurrier when he stated it was important to “stop the run game at Georgia” because he “noticed a lot of “long runs” by their backs. The stage was set for Georgia to make the state proud and take its place among the elite of elite in college football. Unlike the Braves, though, this one seemed over once the whistle blew. Let me start by saying this: I am never one to turn off a game or consider something over before it becomes apparent because of time or the names on one of the sides warrant it (See: State, Savannah). But after watching 15-minutes of the flattest football a top-5 program had ever displayed I walked away. I couldn’t believe it. Connor Shaw played Steve Spurrier’s game plan to perfection confusing an over-anxious Georgia defense, who came in preparing to stop Marcus Lattimore, with perfectly executed play-actions and well-timed bootleg rush/throw combinations. Before the hype could legitimately wear off the game seemed all but lost. It was 7-0 before I could get my couch seat warm. But it wasn’t over then. Certainly Aaron Murray was ready to lead this team to the promised land and navigate them through the hostile environment. Then he stared down Malcolm Mitchell and allowed a defender to tip a pass whose lane he knew it was coming to. As the ball popped straight up, things slowed down; and as much as I knew better, as much as I knew a ball in the air that long statistically meant bad things, all I could do was hope it would hit the ground and give me and my beloved state some semblance of a break. It landed in the Gamecocks defenders hands. Shortly thereafter they scored a touchdown. It was 14-0. Still the optimist I watched as pass-after-pass was incomplete on the next drive for a three-and-out. Georgia was forced to punt, but obviously someone forgot to mention to Collin Barber how good Ace Sanders is. Don’t worry, Sanders was more than willing to remind him on the 70-yard punt return for a touchdown that put South Carolina up 21-0 and ultimately iced the game. With 6:29 left in the first quarter. 35-7. That was the end result. That was the score of a game that was supposed to be Georgia’s moment in the sun. National Title hopes? Dashed. Eastern Division of the SEC? We’ll be scoreboard watching again hoping LSU and Florida can help out a bit with that one. Top-5 ranking? Gone just as quickly as the Bulldogs dropped to 14th in the country (which was a little shocking). I don’t need positive spin or reasons why those teams under-performed. I don’t need to look at tape or read about it or watch Sportscenter fill their time with more slights, this time less subtle than the normal. I needed Mark Richt and Todd Grantham to have this team prepared to battle. I needed a performance and a win to wash the bad taste the Wild Card round left in my mouth 24-hours earlier. What I got was more of the same from teams I’ve followed since I was a kid. If you’re wondering, the answer is “no”, I don’t feel better that the Falcons beat the Redskins. I’ve been on that train before as well and what it got me was a blowout loss to the Packers in the Divisional Round when they were the number one seed and two points last year with a supposedly new and improved explosive offense. Their duty was to make sure the state of Georgia didn’t get rid of teams altogether. I will never forget those 48-hours of futility from two teams that are better than that. Is there a such thing as a cultural sports change for a state? Who knows. What I do know is that something has to change in the mentality of these programs and franchises. “All business” isn’t working for the Braves and Bulldogs. They appeared weak, outmatched and outplayed this weekend and that is why the city exhibited such disdain for the call on Friday. They needed someone to blame even though they were well aware their Braves weren’t ready. 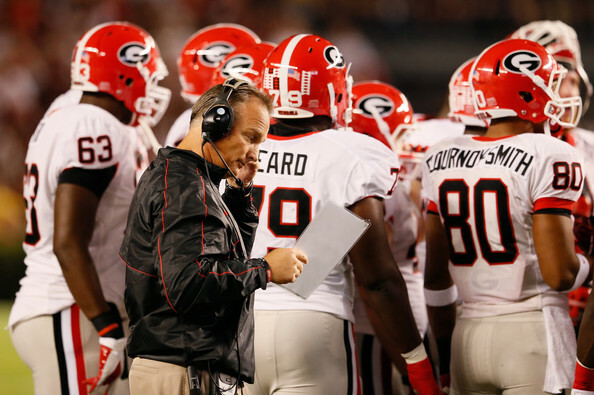 That’s why the calls for Richt’s job continue, because ultimately you have to do better. I know we expect better. Next Post Here’s to Chipper Jones. Lifetime Brave and Future Hall of Famer. more, “pop”! Your content is excellent but with images and video clips, this website could undeniably be one of the best in its field. I would LOVE to do this. But I, unfortunately, am still learning things as I go along and don’t have the requisite knowledge to do so. I appreciate the comment and the read. Any and all recommendations/help would be more than appreciated! Thanks again!